During the simulation, I started off by writing our language. Two people worked on the architecture and two people worked on the laws. One good thing about the simulation was that we had quite a few rubber bands to trade, and we got our materials from trading pretty quickly. One bad thing was that the two lawmakers didn’t get along and argued a lot, so we didn’t finish making the laws. While we were building our top secret invention (catapult) we had to use tape sparingly, so the two base forks that stood the whole thing together kept sliding around, because it was wedged between two desks. And sometimes the tape would fail to do it’s job, to stick things together. Eventually, we got beaten by two other civilzations that finished at the exact same time. If I could change one thing it would be to take things just a tad bit slower while building the catapult, because rushing made it messier. I went to 3 different restaurants and reviewed them. I took these factors to consideration: taste, texture, environment of the restaurant, service, price and value. Something I did well was keeping track of my stuff when we’d go around different places. And giving my honest opinion. Also learning how to give an honest opinion, and really looking into details that help factor my decisions. There weren’t many challenges, because all I really did was eat food and write about it. It lets kids explore their interests and express themselves. It also gives us a break from normal school work. Kyo Sakura is a Japanese restaurant in Shine City. First off, they have a good selection of food on their menu. They have sushi, ramen, and teppanyaki. The restaurant has two stories. So when we went, we got seated upstairs. While we walked upstairs, for whatever reason there was a cigarette smell in the stairway. So that’s a downside. Now for the food: I got a salmon hand roll for 35 RMB, which is pretty good, since a plate of two pieces of nigiri would range from 30-40 RMB. The texture of the salmon was pretty soft and nice. I like it when sashimi almost has a buttery texture because it’s soft. For being raw salmon outside of Japan, it’s fine, because if it wasn’t fine then I’d have probably gotten sick. There were some cucumber slices which added a nice crunch and freshness to the roll. The seaweed wasn’t too soggy, and of course, the rice had the classic rice vinegar taste, which is always a plus. 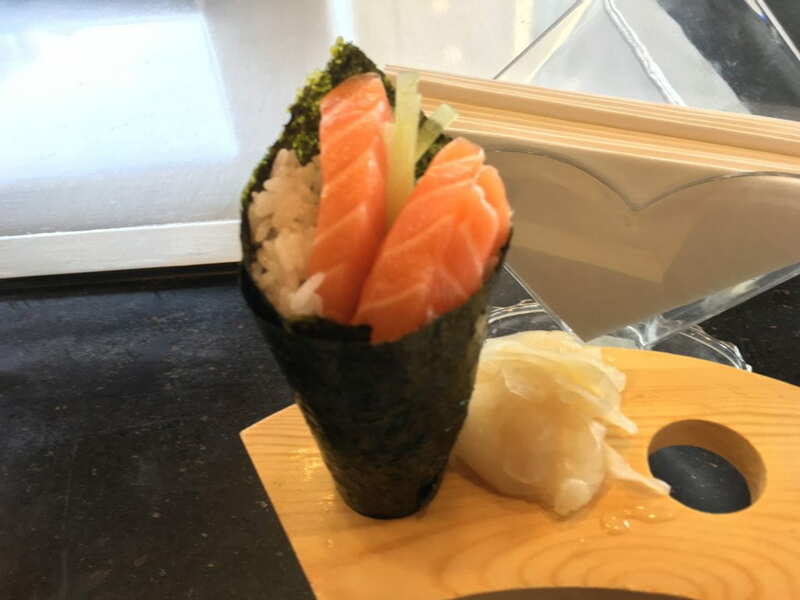 I’m not exactly sure what happened, because my friends each ordered a hand roll as well and theirs came around 15-20 minutes after but for whatever reason, maybe they forgot but mine took a while. Almost 10 minutes after the others. So, the final conclusion: would I recommend this place? Yes. Being half Japanese, I’d say this place is pretty good for not actually being Japanese, as in it’s outside of Japan and Japanese people don’t work there. But there is a good selection on the menu, and the food is good, so I’d give Kyo Sakura and 8 out of 10. Tan Tan Dalu is a Korean Restaurant in Shine City. It’s mostly Korean barbecue, but they also have other things on the menu. As soon as you walk into the restaurant, you can smell the food, which, personally, is a plus. It kind of looks like a pub style restaurant with brick walls and neon lights. I ordered a dish of pork belly and spicy rice cakes with cheese. The pork belly was fatty and juicy, which was pretty perfect. Also, you get three different sauces, a salad, and four different types of kimchi for free. No matter what you order, you will get those for free. Anyway, the pork belly was cooked on top of onion slices, and in my opinion, the pork belly tastes good dipped in the salt. 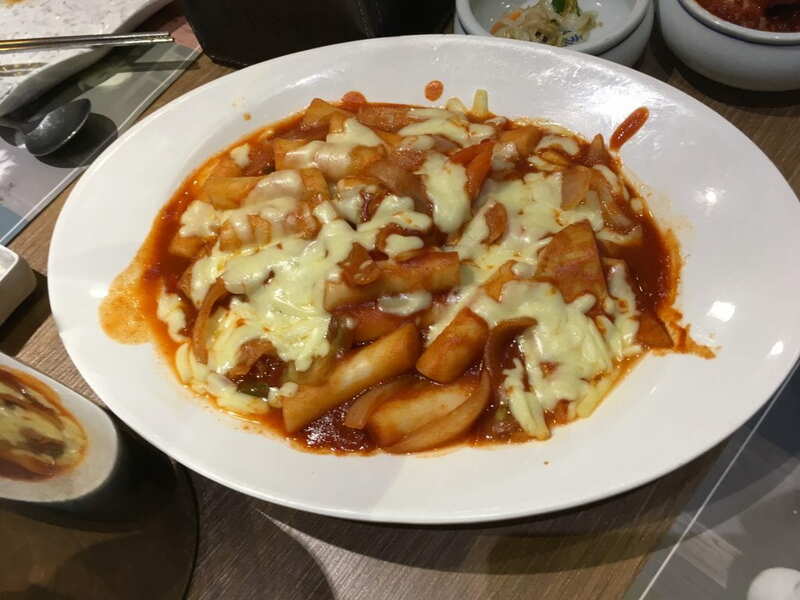 The rice cakes were chewy cylinders, and they were served in a hot sauce with cheese on top. I liked that the cakes were chewy and the cheese would pull which is a major plus. Every good cheesy dish should have a cheese pull. One thing though was that it was pretty spicy. I love spicy food, but if you don’t do spicy then don’t get that dish. The service was pretty okay. It took around 15 minutes for the food to arrive, so kinda average. Final conclusion: would I recommend this place to someone? Yes. Because overall, this place has good food. Unless you’re vegan. Or on a diet. 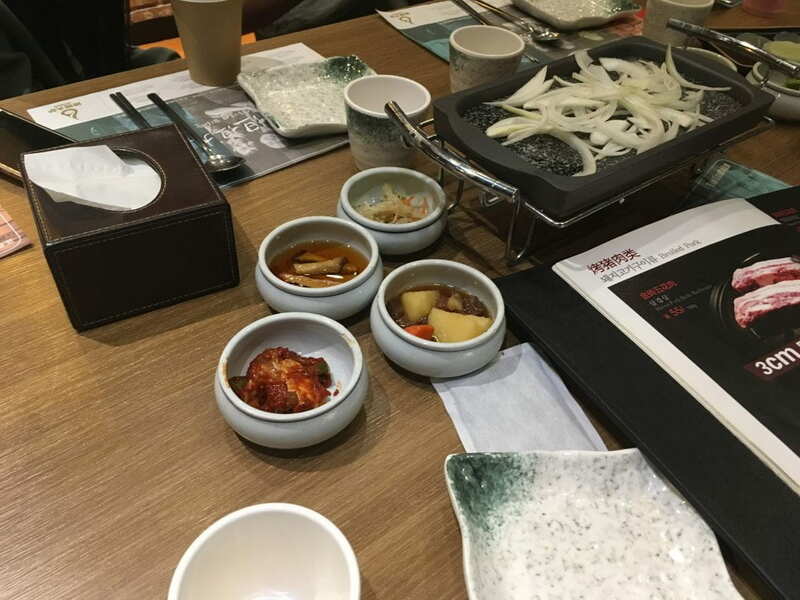 But still, who wouldn’t like a good Korean barbecue? The meats juicy and fatty, which is why it tastes so good. You’d also get free food on the side. I’d give Tan Tan Dalu an 8 out of 10. 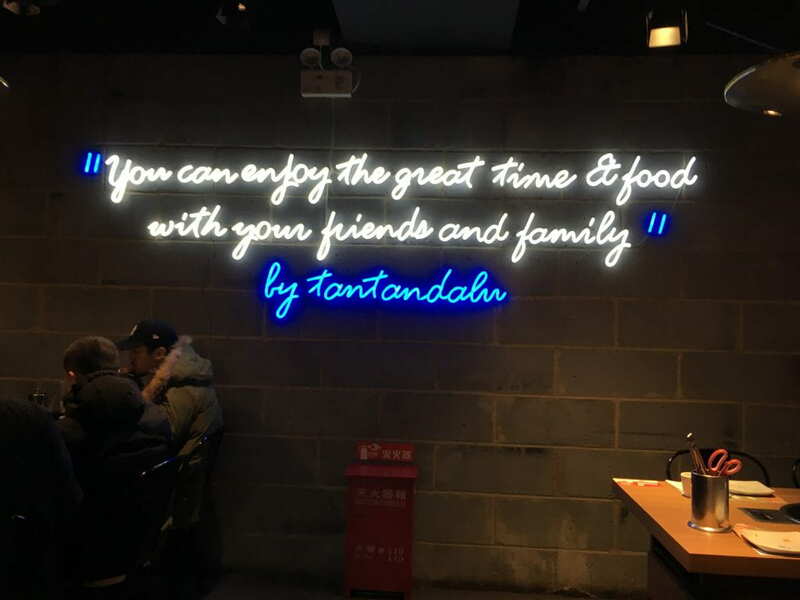 Paul’s Steak and Eggs is a restaurant with mostly western food, located in River Garden, Shunyi. Upon first glance it’s a very small restaurant. It’s pretty quiet, so if you’re into cozy places, Paul’s Steak and Eggs is nice in that aspect. 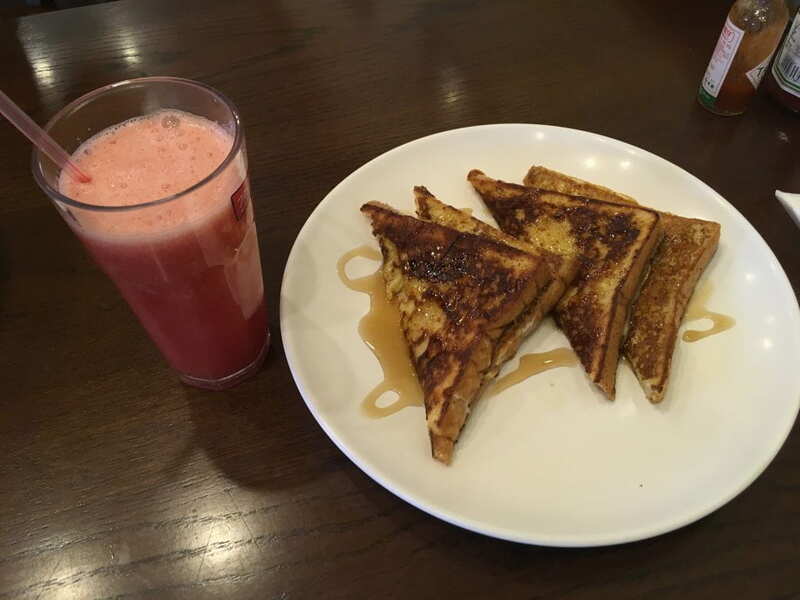 Now for the food: I ordered two pieces of french toast for 35 RMB and a watermelon juice for 25 RMB. Overall, the french toast was good, but one downside was that it was plain. Not much to it, just french toast with maple syrup. If I could change something, it would be to add cinnamon and fruit on top for more flavor. 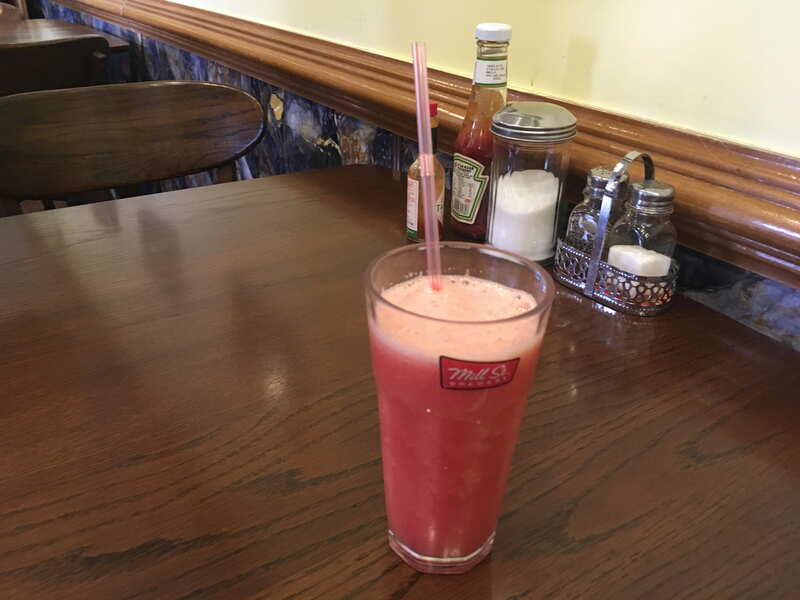 The watermelon juice was similar, in the fact that it was just watermelon juice. To be fair, I can’t think of any way to make watermelon juice “not just watermelon juice” without, pretty much, completely changing it. Watermelon juice is supposed to be watermelon juice, so I’ll give them that. 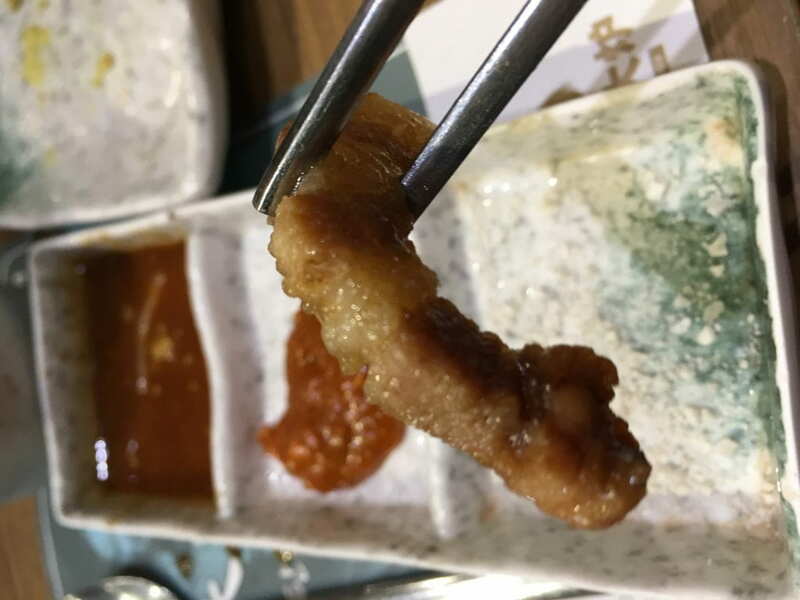 I paid for a total of 60 RMB for my food, which is a good price for what you get. In addition, the service was good. It took around 10 minutes for my food to arrive, which was fine. The waiters really took what costumers wanted into consideration. Final conclusion: would I recommend it to someone? Not really. Although the food isn’t bad, it’s pretty basic. Like a “Yeah, I’ve had this stuff before.” kind of reaction when eating. So I’d give Paul’s Steak and Eggs a 6.5 out of 10. In Humanities, we studied an ancient civilization (Ancient China, Ancient Egypt, Mayan Civilization or the Indus River Valley). We chose a significant accomplishment/discovery/invention of the civilization to make a video about. And this is our end result, made by me (Lia), Emily C. and Angel in 6.3. Hope you enjoy it! For humanities, I was in the group that studied technology for early and modern humans. With all the research, I put together a Thinglink. Enjoy! This is our penguin house. It’s made out of bubble wrap for the base, and covered in mylar foil sheets. There is also some cotton on the inside stuck on the walls. One thing I’m proud of is how much mass of the “penguin” (ice cube) we lost. We lost 1.76 grams after ten minutes, which is really good. 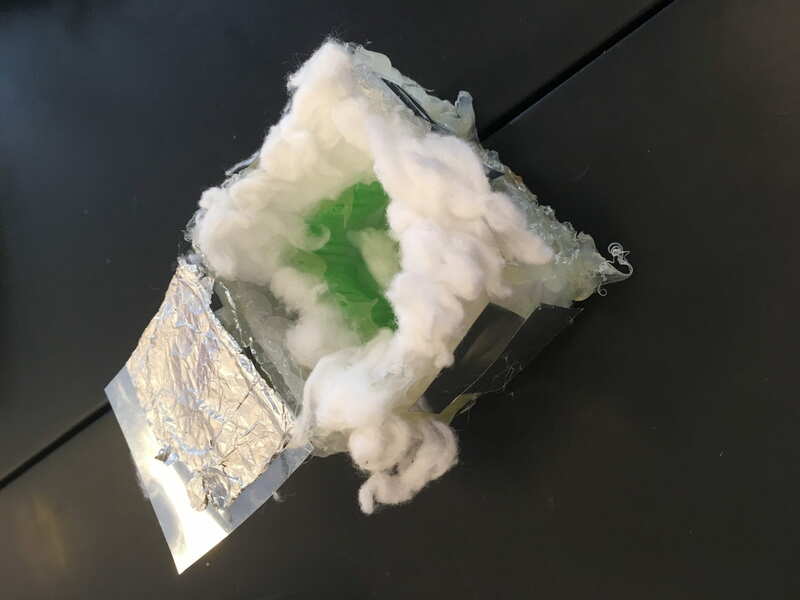 I think because the mylar is reflective, it reflected some of the thermal energy, protecting the ice cube inside. 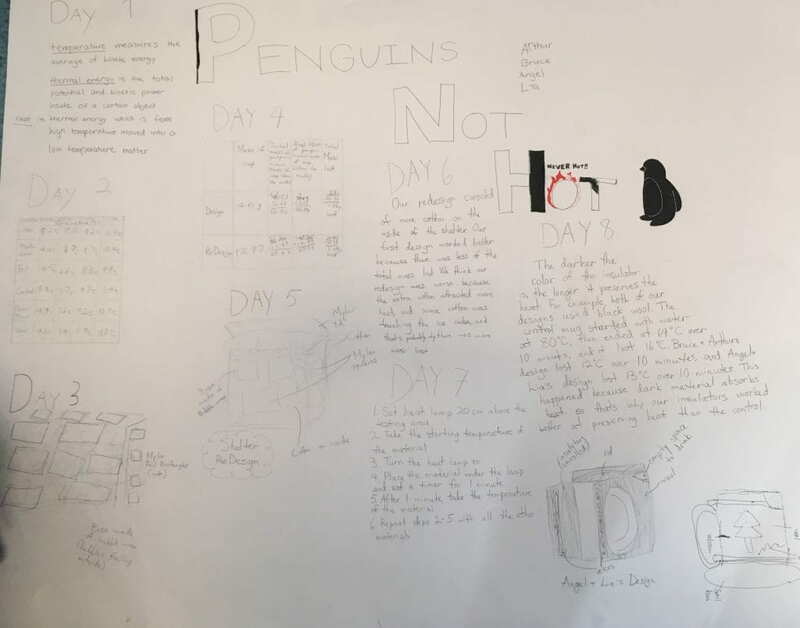 One thing I’d change is to remove some of the cotton, because it’s kind of unnecessary, and maybe it would be a better environment for the penguin with less cotton because the cotton might have made it warmer inside. The hardest part about this project was using our squid (our money to buy the materials) wisely. Because it’s hard to tell how much of something you need and some materials were very expensive too. We were only given 200 squid for a design and redesign combined. 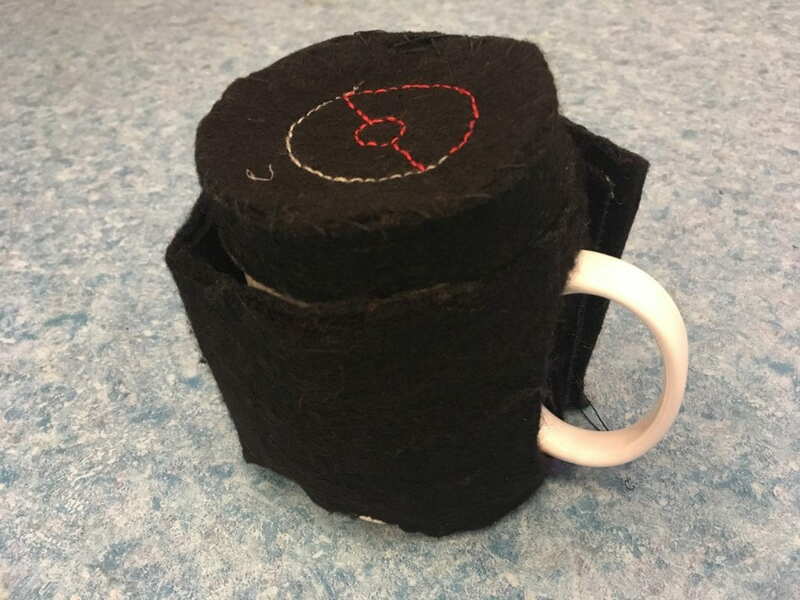 This insulator is made of felt, sandwiching a layer of cotton inside. The lid is there to keep the steam inside the mug, so it would end up warmer than without it. We used velcro to make it easy to put on & remove. I’m proud of the design on the lid (credit goes to my partner Angel for making the pokeball). One thing I’d change is the length of the the insulator, because it’s a bit loose around the mug. I also would layer on more material to prevent more heat loss. The hardest thing about this project was getting enough done in the amount of time we had. We only got to make one prototype because there wasn’t enough time for a second one.